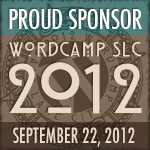 We will be in attendance at the 2012 WordCamp SLC on September 22nd. I will be presenting on WordPress theme development and Event Espresso are one of the official sponsors for the event. Seth and Garth will also be in attendance. Be sure to come find us and say hi! 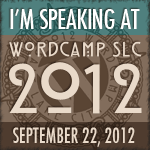 If you are planning to be in town (or nearby), and you haven’t registered for SLC WordCamp, do it today!